Hidden Creek Horses was established in 2001 by Roger Brown and Donna Miller. After years of searching and hard work, they were able to finally realize what had previously only been something they saw in their dreams. In June of 2001, Roger, Donna, Ethan and Devon moved from the "suburbs" to a little piece of paradise. The family specializes in finding and training sport horse prospects. Once sold, these horses are so successful in their new homes because they are given a proper foundation with tons of attention (there are never more than 4 horses living at HC, plus Petie of course) and are completely adjusted to the routine of daily riding. They leave the property often to school at local farms, and compete as far away as Florida, Kentucky, Tennessee, North and South Carolina and Virginia. Hidden Creek Horses specializes in Connemara ponies and larger Connemara crosses. We have been involved with the breed since 1996 when we purchased No Secrets, a half bred by Ian McVeigh. We have owned various part and full breds since. In 2006 we decided to import our Stallion, *ArdCeltic Art. Our model was to develop Art as a performance pony before breeding our own sport horses. Art has exceeded all expectations and in four years has developed from an unbroke three year old into a very competitive dressage and eventing stallion, competing and winning at 4th level dressage and Intermediate Eventing. He has won numerous ACPS and national awards and is recognized throughout the world for his accomplishments. Foaled in 2010, he is a lovely Cross of TB, Dutch warmblood, and Connemara. Our goal is to produce a larger partbred that will be suitable for packing juniors and Amatuers but also for upper level eventing. 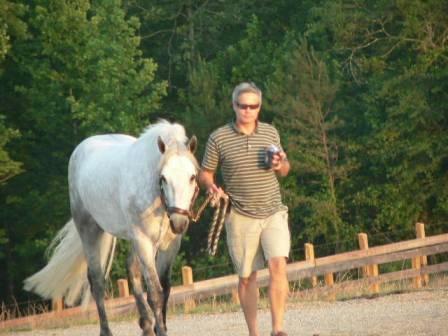 Above photo: Art and Roger out for a stroll at Poplar Place Farm Area III Championships.